A Colombian TV show has drawn flak for making a racist gesture when introducing BTS, a K-pop band that has been gaining worldwide popularity. 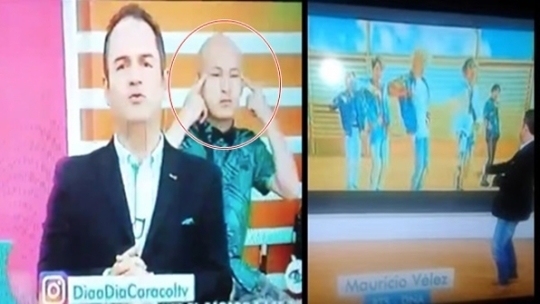 The host of the show “Dia a Dia” had introduced BTS’ latest album, which had prompted a man behind him to make a “slant eyes” gesture by lifting the corners of his eyes. After the broadcast was aired, a Twitter user with the name “ARMY (fan club of BTS) Colombia” apologized on the social media platform, saying that it is “sincerely sorry” about the incident. The user added, “In our country, (it) is not very common to talk about Asian culture. We are working very hard for the Asian culture (to be) much more recognized and for referring to them properly and respectfully. Meanwhile, Colombian national soccer team player Edwin Cardona was recently blasted for making a racist gesture on the field to his Korean opponents. Another Colombian TV show had imitated the player’s gesture, which led to criticism that it was openly mocking Asians.